Ms. Beatty received her bachelor of science degree in nursing and a master of science degree in nursing in the family nurse practitioner (FNP) program from Pace University’s Leinhard School of Nursing. 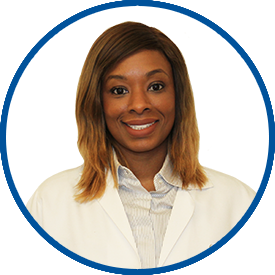 Most recently, she completed several clinical rotations with Westmed Medical Group, including women’s health, pediatrics and internal medicine and at Methuselah Medical Services in New Rochelle in geriatrics. Currently, she is also a labor and delivery nurse at New York-Presbyterian Hospital/The Allen Hospital, New York, NY. Ms. Beatty is certified as a nurse practitioner by the American Association of Nurse Practitioners. Perfection. She cares when I hurt, have problems or need a change. She listened to my concerns and provide another specialist for me, she explained possible effect of new medication clearly. She did her job professionally.